Mix the smoked paprika, chipotle pepper and salt in a small bowl. Sprinkle all over the chicken thighs and keep aside for 2 to 3 hours. Heat a deep saucepan with the olive oil. Brown the chicken pieces on both sides on high heat for 2 to 3 minutes. Take the chicken out and add the onion and garlic. Saute on medium heat for 3 to 4 minutes. Add the orange juice and tomato paste. Mix well and add the adobo sauce and tomato sauce. Bring to a boil and add the chicken pieces back. Lower the heat and cover the saucepan. Cook 30 to 40 minutes. Check for seasonings and cool with the lid off. Shred with a fork and add cilantro. Keep aside. 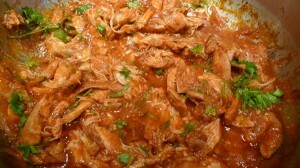 Use the shredded chicken to make quesadillas to your liking. I would recommend Monterey jack or mozzarella cheese. Serve with peach salsa, lime rice and guacamole.